Friday is here and many are happy about it. Could you tell me why? Could you tell me even one reason why you happy when it is Friday? 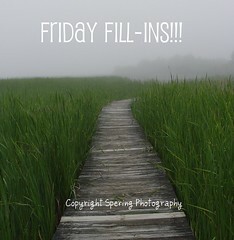 And so Friday filling-ins is here. 1. There is something about this time: 6:58. 2. It was the reason, of course, that two minutes to go then it will be seven o'clock. 3. Cooking our viand, well whole dinner actually --- is something I no longer feel the need to do. 4. I have another errand to run, then off and watch TV. 5. Okay, please... just go find it. 6. What were once vices are not good way back then and even these days________. 7. And as for the weekend, tonight I'm looking forward to have a date with friends_____, tomorrow my plans include get a gift bag, grocery shopping and Sunday, I want to go to church, really! Whats up with the time 6:58 to yout sang? hehehe good luck sa plans hope it will realize. heheh.. bawo sa moderator Tsang.. heheh.. muahhh! musta ang inyong weekend madam sis? hehehe...glad to be here again! Hello Baje. Naa koy award para sa imoha. Ikaw na mag-ego if imo gusto epost or not. You deserve kasi dani ai. Musta naman u diha? quick visit lang, di kita abutan sa plurk.. hihi..